Los Angeles – Attorney General Edmund G. Brown Jr. announced that three individuals — Howard K. Stern, Doctor Khristine Eroshevich, and Doctor Sandeep Kapoor – have been charged with conspiring to “repeatedly and excessively” furnish controlled substances to Anna Nicole Smith. Attorney General Brown will discuss the charges and the arrests Friday, March 13 at 10:00 a.m.
Over a period of three years, Doctor Khristine Eroshevich, Doctor Sandeep Kapoor, and Howard K. Stern furnished thousands of prescription pills to Ms. Smith, including opiates, benzodiazapines, and other controlled and non-controlled substances. Doctor Eroshevich and Doctor Kapoor falsified prescriptions and prescribed unwarranted amounts and combinations of highly addictive medications. 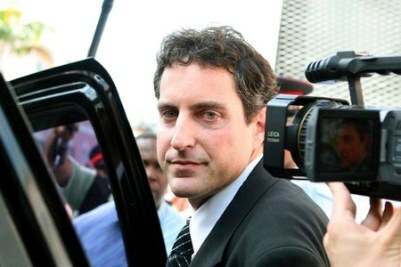 Howard K. Stern, Ms. Smith’s attorney and confidant, served as a vital link in obtaining, delivering, and administering these prescription drugs to Anna Nicole Smith. The investigation, launched in March 2007, is a cooperative effort between the California Attorney General’s Office, the Medical Board of California, the U.S. Drug Enforcement Administration, and the California Department of Insurance, Fraud Division. Agents from these organizations worked in conjunction with the Los Angeles County District Attorney’s Office executing multiple search warrants, reviewing over 100,000 computer images and text, analyzing patient profiles and pharmacy logs, and have interviewed dozens of witnesses throughout the country and abroad. Eleven counts were filed today. Arraignment dates for the defendants have not yet been scheduled. Bail was recommended at $20,000 for each defendant. AWESOME!! Finally some sort of justice for Anna Nicole has begun. Will murder charges follow? previous post: Octomom Nadya Suleman Has Angels In Waiting. Or Does She? 50 queries in 0.608 seconds.